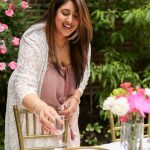 Nisha is the founder and editor of Love Laugh Mirch, an Indian inspired lifestyle site where she shares her take on traditional recipes, approachable DIY’s and motherhood moments. She's a believer in ghar ka khana, Nani ke nushke, infusing the everyday with culture and family first. You can often find her on Instagram @lovelaughmirch making chai or cooking dinner while having a dance party with her little one.